Lack of money… Guilt over family left behind… The stigma of seeking counseling… Latina women, particularly immigrants, face many fears. 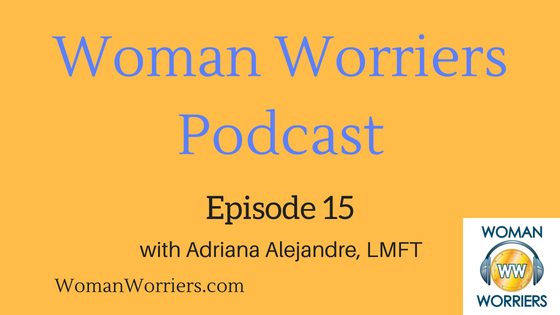 In this episode of Woman Worriers, creator and host Elizabeth Cush and her guest, Adriana Alejandre, MA, LMFT, talk about anxiety and women of color. As the child of an immigrant whose mother experienced severe trauma in her native Guatemala, Adriana Alejandre has focused her therapy practice on overcoming anxiety and has made it a mission to help overcome the cultural stigma surrounding mental health counseling. In this episode of the Woman Worriers podcast, creator and host Elizabeth Cush, of Progression Counseling in Annapolis, Md., talks with her about the challenges that women of color face fitting into a white patriarchal society, the impact of violence against women, the stigma of asking for help and an innovative technique for healing past trauma. Subscribe above to the monthly Woman Worriers Newsletter so you don't miss a thing!